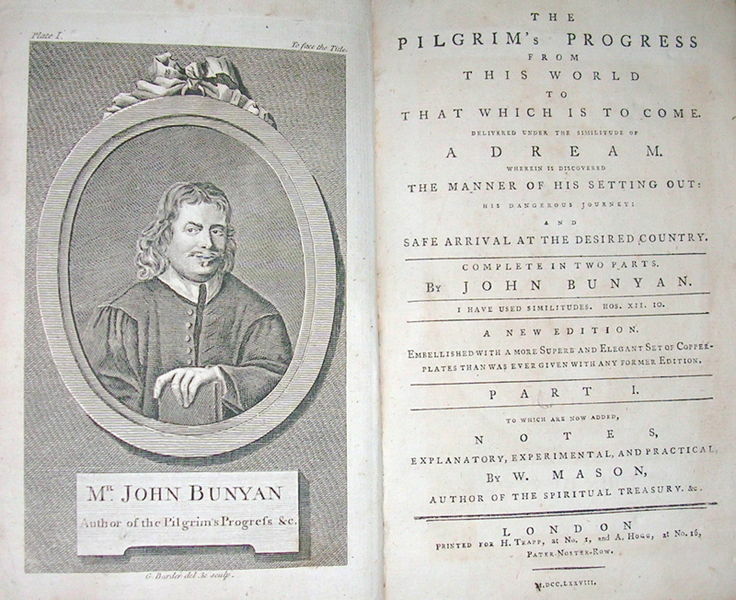 I read that “The Pilgrim’s Progress” is the most-read book written in English. If you’ve read it you know why. One of the most powerful sections comes from “The Tenth Stage”. Hope and Christian journey to the Celestial City as companions. After meeting Ignorance they enter into a conversation. Here is the first half. I intend to post the second part tomorrow. Hope: Now, since we are talking about him [Ignorance], let us inquire a little into the reason of the sudden backsliding of him and such others. Christian: It may be very profitable, but you begin. 1. Though the consciences of such men are awakened, yet their minds are not changed: therefore, when the power of guilt wears away, that which provoked them to be religious ceases; wherefore they naturally turn to their own course again; even as we see the dog that is sick of what was eaten, so long as the sickness prevails, vomits and casts up all; not done of a free mind, (if we may say a dog has a mind,) but because it troubles its stomach: but now, when its sickness is over, and so its stomach eased, its desires being not at all alienated from its vomit, turns around, and licks up all; and so it is true which is written, “The dog is turned to its own vomit again.” (2 Peter 2:22) Thus, I say, being hot for heaven, by virtue only of the sense and fear of the torments of hell, as their sense and fear of damnation chills and cools, so their desires for heaven and salvation cool also. So then it comes to pass, that when their guilt and fear is gone, their desires for heaven and happiness die, and they return to their course again. 2. Another reason is, they have slavish fears that do overpower them: I speak now of the fears that they have of people; “For the fear of humanity brings a snare.” (Proverbs 29:25) So then, though they seem to be hot for heaven so long as the flames of hell are about their ears, yet, when that terror is a little over, they have second thoughts, namely, that it is good to be wise and not to run (for they know not what) the hazard of losing all, or at least of bringing themselves into unavoidable and unnecessary troubles; and so they fall in with the world again. 3. The shame that attends religion lies also as a block in their way: they are proud and haughty, and religion in their eye is low and contemptible: therefore when they have lost their sense of hell and the wrath to come, they return again to their former course. 4. Guilt, and to meditate terror, are grievous to them; they do not like to see their misery before they come into it; though perhaps the sight of at it first, if they loved that sight, might make them fly to where the righteous fly and are safe; but because they do, as I hinted before, even shun the thoughts of guilt and terror, therefore, when once they are rid of their awakenings about the terrors and wrath of God, they harden their hearts gladly, and choose such ways as will harden them more and more. Christian: You are pretty near the business, for the bottom of all is the lack of a change in their mind and will. And therefore they are but like the felon that stands before the judge: and quakes and trembles, and seems to repent most heartily, but the bottom of all is the fear of the halter: not any detestation of the offence, as it is evident; because, but let this felon have liberty, and they will be a thief, and so a rogue still; whereas, if their mind was changed, they would be something else. Neat! And its truth is inescapable. I’ve just finished reading this to my kids for the second time. It is rich with truth! It works great as a read aloud in the today’s English version. It is a must read for Christians.